SIMI VALLEY, Calif. — Defense Secretary Jim Mattis is subtly making a pitch to Congress — and President Trump — not to cut defense spending. After two years of steep defense spending increases bringing defense spending to $716 billion, Trump has called on all federal agencies to cut spending by 5 percent. For the Defense Department, that would mean dropping from $733 billion to about $700 billion., In addition to that, federal spending caps mandated by the Budget Control Act of 2011 could cut spending levels an additional $50 billion to $80 billion in fiscal 2020. “Thanks to President Trump and Congress, we have begun to arrest the erosion of our competitive advantage, but without sustained, predictable funding, the gains we’ve made will swiftly fade and our investments will never realize their full potential,” Mattis said Saturday at the Reagan National Defense Forum, a conference of Pentagon leaders, lawmakers, defense executives, lobbyists, and consultants. 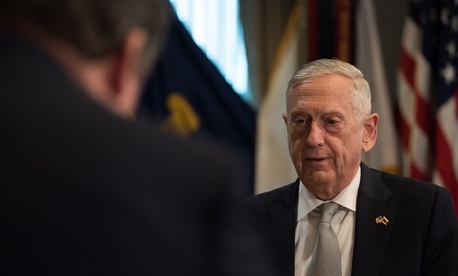 “I share a responsibility with Congress: that not just the next secretary of defense but the secretary after next has the military advantages necessary to deter conflict or win if we must fight,” Mattis said. The secretary’s speech at the Reagan Presidential Library in the picturesque mountains north of Los Angeles, marks the return to a message from Pentagon officials that have dominated this decade: The military would suffer if its budget is cut. Defense officials say that the spending increases of 2018 and 2019 are improving the military’s so-called “readiness” to fight and deter conflicts, but they also say they need to keep increasing the Pentagon budget to fund new weapons to counter technological advancements by Russia and China. “It’s only a downpayment of where we need to be,” said retired Gen. Jack Keane, former vice chief of the Army who is chairman of the Institute for the Study of War and a frequent advocate for increased defense spending. “We need five steady years of stable and predictable funding at a minimum. Rep. Steve Womack, R-Ark., chairman of the House Budget Committee, said he expects a lawmakers to clash once again over the balance between discretionary and entitlement spending. “The real challenge for this country is when are you going to acknowledge the problem you have with your fiscal glide path … on the mandatory side of the spending,” Womack said, referring to entitlements. A survey conducted by the Ronald Reagan Institute in the weeks following the November midterm election found about 75 percent of Americans favor increases in defense spending. Younger citizens and Democrats are among the least likely to favor increased military spending, according to the survey. Rep. Adam Smith, D-Wash., the incoming chairman of the House Armed Services Committee, has said he plans to trim the defense budget, to include spending on nuclear weapons . Womack said he expects Democrats to begin defense spending negotiations at a level much lower than that, closer to what the spending caps will dictate. By law, defense spending is capped at $576 billion in fiscal 2020. So, assuming lawmakers passed a White House request for $733 billion, along with a $73 billion Overseas Contingency Operations request for cap-exempt war spending, then about $84 billion would be cut through sequestration, according to Capital Alpha Partners’ Byron Callan. If a $700 billion budget is presented, about $53 billion would have to be cut. Last month, Deputy Defense Secretary Patrick Shanahan said if the Pentagon’s budget shrinks from $733 billion to $700 billion, it would likely mean slowing new weapon buys and planned increases to the size of the military. Mattis, during his comments, praised Trump for negotiating defense spending increases during his first two years in office. “Go back in time two years: we were fighting overseas yet automatic spending caps had resulted in the smallest U.S. military since 1940; shortages of key munitions, aircraft unable to fly, ships unable to sail; an aging nuclear deterrent and an eroding technological edge in an era of renewed great power competition… a sobering reality, yet nothing under the sun is new,” he said. Mattis, however, played down the potential of defense spending cuts actually happening. “We’ve got to make certain we restore America’s strength,” Mattis said. “You know and I know that has been President Trump’s platform from the beginning. It’s up to me to make the logical argument about what the president’s submission should look like from Office of Management and Budget to the Congress. “I’m optimistic at the end of the day, we’ll have what we need to keep our country safe,” he said. Mattis would not reveal how much money that should be or what he wants from the White House. That conversation with the president, he said, would remain private.